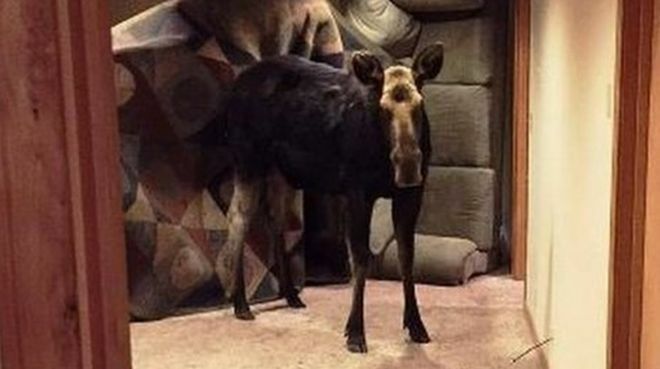 A family in the US state of Idaho had quite a shock when they awoke to find a moose had fallen into their home. The animal tumbled through an unlatched window into the basement of the property in the community of Hailey, in the state of Idaho. 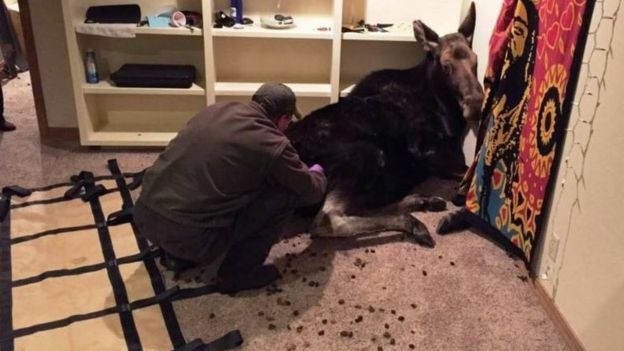 According to the Idaho Mountain Express, the female moose spent about three hours in the house after the mishap early on Sunday morning. Wildlife officials sedated the animal before releasing it unharmed. Blaine County Sheriff’s deputies and Idaho Department of Fish and Game officers initially tried to shoo the moose upstairs. When that failed, a wildlife officer shot the moose with a tranquilliser dart. Ms Emerick said eight officers carried the approximately 600lb (270kg) animal up the stairs. “With a lot of grunting and groaning they got her up the stairs and out the door,” she said. Ms Emerick said the groggy beast came round and ran off about a quarter of an hour later. The night-time intruder caused hardly any damage to the basement room, she added. Heavy snow has driven moose and other wildlife into populated areas in search of food, according to wildlife officials.